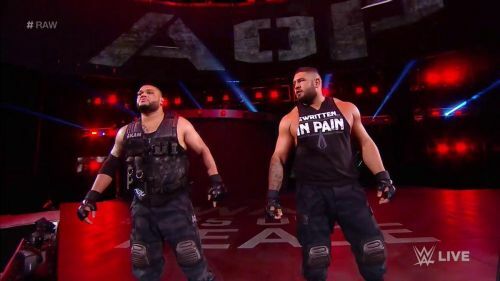 Authors of Pain are the new kids on the block who recently graduated from the NXT and made their way to the Raw roster. The dominant force of Akam and Rezar have more than proven themselves on NXT and were arguably the strongest team on the NXT roster who stuck together with Paul Ellering managing from the side. After moving to the main roster, the duo parted ways with their trusted old manager and found Drake Maverick as their new partner. With the change, we’ve seen some change in fortunes for the duo. Initially, the two were barely used on Raw and were basically just put in squash matches with local competitors or jobbers of the WWE to showcase the strength of the two men. Slowly they moved onto some better competition, but they found themselves like wolves among sheep. Even though it was evident that the AoP will become the Raw Tag Team champions sooner than later since there are no real tag teams on the Raw roster that one can pick out as outstanding other than The Revival, the way they won it was quite unconvincing. The most dominant men on the block? Baron Corbin booked them in a match with Seth Rollins and Dean Ambrose who were the Raw Tag Team Champions, only when he knew that Seth would be forced to defend the titles all by himself. Watching the two men finding it difficult to put down the Intercontinental Champion in a handicap match was painful to watch if you’re an AoP fan, and their victory was not as convincing as it should have been even though they are the heels at the end of the day. Authors of Pain are yet to prove their actual worth to the WWE Universe, especially those who pay little or no attention to NXT. They have finally gotten a chance to do it against two men who can match them in size and strength, and are arguably much better wrestlers than them. The Bar, which consists of Sheamus and Cesaro, have been Raw Tag Team Champions in the past, and are the current SmackDown champions. Facing these two men will be AoP’s first real test on the main roster at their first pay-per-view for the main roster. Since they have been booked to face The Bar at Survivor Series, Akam and Rezar should put on the best show they have yet to come out on top. It is important that the two men win the match to further their dominance on the main roster which hasn’t quite taken off well as yet due to the lack of quality teams on Raw. The Bar has nothing much to prove at this point in their career, and a loss for them will not hurt their reputation as much as it will hurt Authors of Pain’s if they lose their first big match on the main roster for Raw. 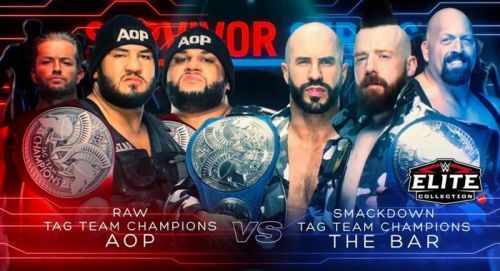 Even though Big Show will be on The Bar’s side to ensure that they don’t score a loss for the blue brand, overcoming the odds will help AoP excel in their hunt to become the kings of the tag team division.